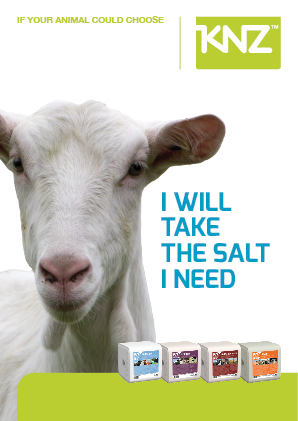 KNZTM BASIC 100 is pure salt with 99.9% sodium chloride. Can be used for all animals. 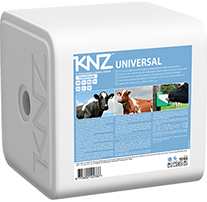 KNZTM UNIVERSAL is the ideal addition to the basic ration or TMR. In addition to salt and magnesium, it contains the essential trace elements magnesium, zinc, copper, iodine, and selenium. 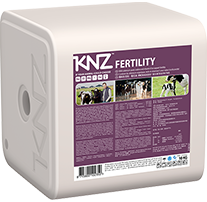 KNZTM FERTILITY supports fertility by a high content of selenium, iodine, and vitamin E. Use of selenium yeast guarantees a better absorption of this element. 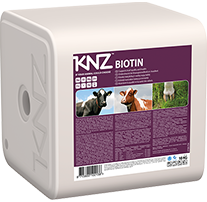 KNZTM BIOTIN helps to prevent claw diseases and can improve body condition and milk yield. 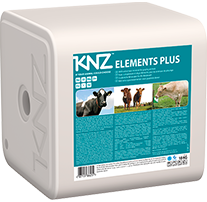 KNZTM ELEMENTS PLUS contains extra copper and zinc. 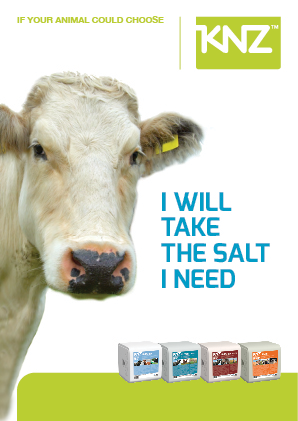 Excellent additions for grazing cattle that have a higher need for these elements. 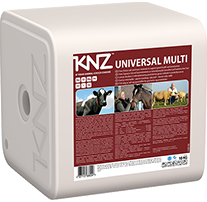 KNZTM UNIVERSAL MULTI is enriched with iron. 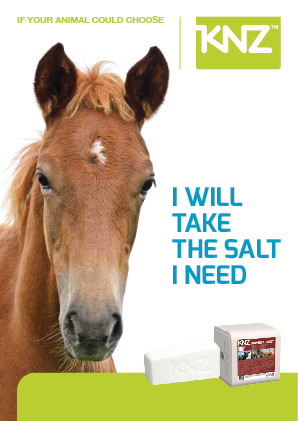 This salt lick is very suited to animals with a higher need of iron or with an increased production level. 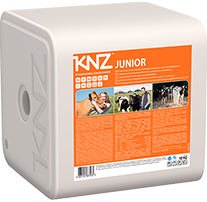 KNZTM JUNIOR is specially composed with trace elements and vitamins for young, growing animals. It helps them to reach their growth potential. 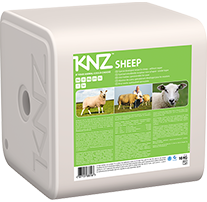 KNZTM SHEEP is specifically developed for sheep. In addition to salt and magnesium, it contains essential trace elements like zinc, iron, iodine, and selenium. 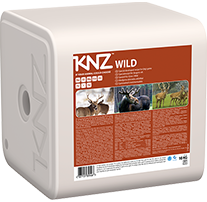 KNZTM WILD is specially developed for wild game. The salt lick contains not only sodium and chloride, but also magnesium, zinc, copper, iodine, selenium, and iron. 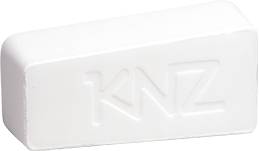 Besides contributing to the mineral and trace element need, the KNZ lick also attracts animals to the feeding station. 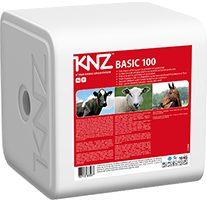 KNZTM HORSE is the ideal addition to the basic ration and contains apart from salt and magnesium also the essential trace elements zinc, copper, iodine, selenium and iron. 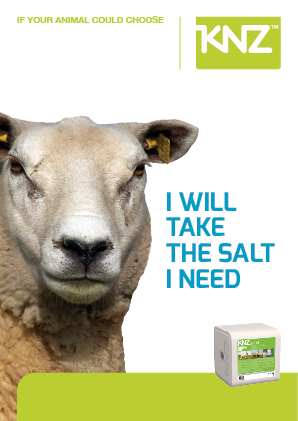 Salt is an essential mineral. Among other things, it maintains a good acid and fluid balance. It also plays an important role in the functioning of the central nervous system and muscular contraction. 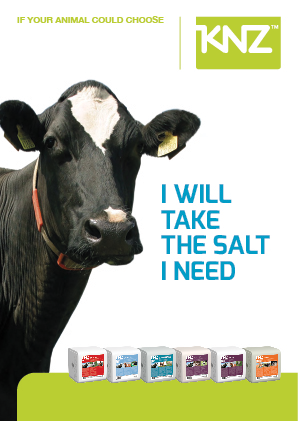 Moreover, KNZ salt supports the intestinal flora, which results in a better digestion. Among other things, Magnesium ensures healthy nerve cells, strong bones, and good muscle formation. Iodine is essential for basal metabolism by producing thyroxin by the thyroid gland. It has a positive effect on growth and development. Selenium plays an important role in fertility. Selenium is a component of the antioxidant enzymes, protecting against cell damage. It prevents muscle disturbances and enhances the effectivity of iodine. Zinc plays an essential role in many body processes, like enzyme systems concerned with metabolism, the healing process and disease resistance. Zinc is essential for skin and bone development. Iron is a component of red blood cells and improves the functioning of organs and tissues. It also and plays a role in oxygen transport. Copper is required for enzyme activity, plays a role in the central nervous system, and is associated with iron metabolism. To have enough copper in feed is also essential for strong bones. Vitamin A is important for the maintenance of the immune system, metabolism and reproductive function. Vitamin A is especially important when little fresh grass is fed as the levels of vitamin A go down during feed storage. Vitamin D is important for strong bone development. Vitamin D also plays a role in cell growth and –division like in the immune system. A deficiency of vitamin D could lead to problems with calcium metabolism (e.g.milk fever), decreased feed intake, impaired growth, and deterioration of bones. Vitamin E has a synergetic effect in combination with Selenium. It protects membranes and prevents muscle, liver and blood vessel degeneration. White muscle disease is a classic sign of a clinical deficiency of vitamin E.
Biotin is a water soluble and nitrogen containing essential vitamin (Vitamin H or B7) which is restricted available in nature. 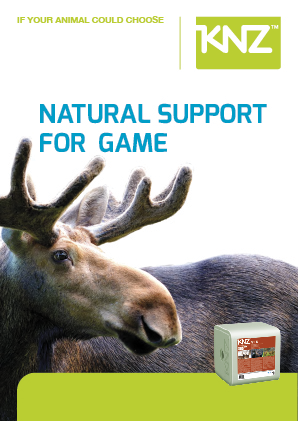 It promotes hoof health by improving horn quality.